While you may think of architects as being responsible solely for planning the layout and structure of a building, many interior design elements are also influenced and chosen by the architecture firm working on your project. Don’t think that your architects will be selecting fabrics for you or coordinating the artwork on your walls, Read-Warden cautions. The work architects do on most projects is more along the lines of finishes — carpet or tile for the floors, paint for the walls, stain for the cabinets, and even the placement and appearance of the lighting fixtures. Many finishes are chosen because they’re functional. You might put tile in a bathroom because it serves a very practical purpose — it’s easy to clean and durable. At the same time, there are artistic and design considerations that influence how the interior of a space flows and is used. “If there is a particularly important space in the interior, we’re already thinking about the materials as part of the schematic design phase,” Read-Warden says. How does the client influence the process? By collecting ideas and listening to feedback about specific materials. 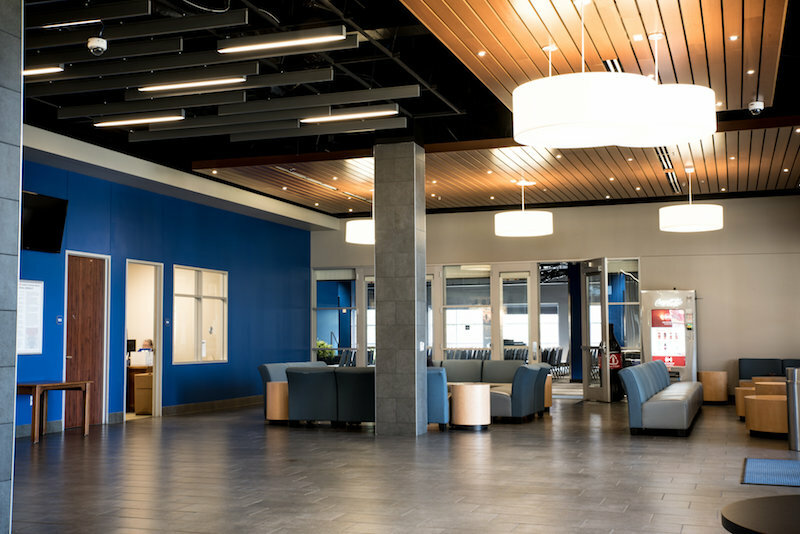 Read-Warden points to her firm’s recent renovation of the student center at Blinn College in Bryan, Texas as a perfect example of how interior finishes are a big part of the architect’s job. For Blinn, which uses a bright blue as its identifying color, integrating the right accents was a challenge. Not every wall needed to be blue, Read-Warden says. Because it was such an intense color, the blue could be used as a wayfinding device. 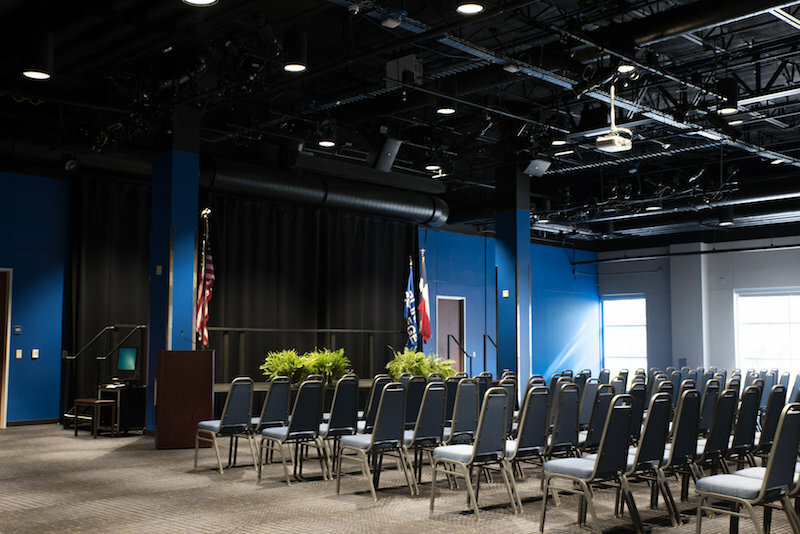 For the wall in the student center where visitors would move into their auditorium, the bright blue served as an ideal accent. 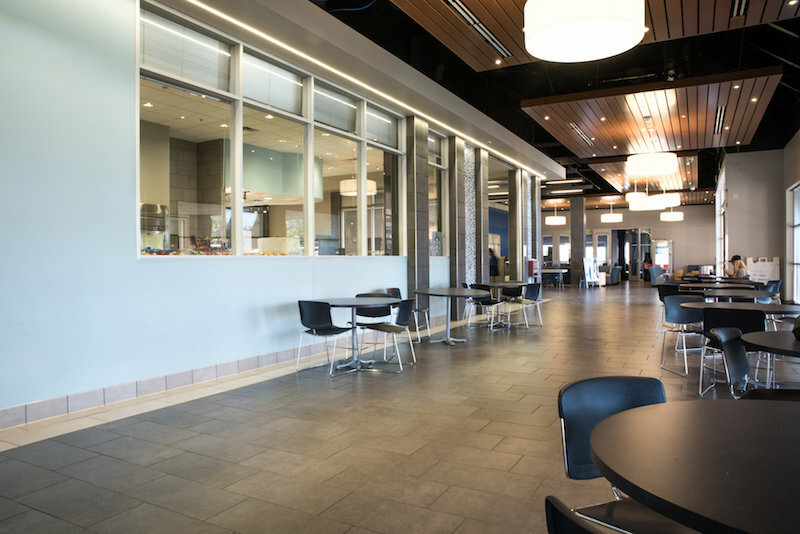 Lighter, softer blues and big, transparent glass walls featured in areas between the student center’s lobby and food service area. 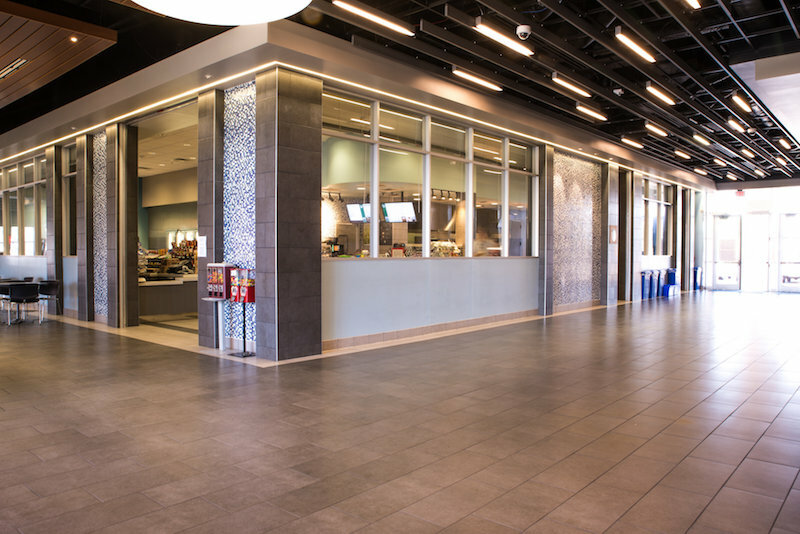 White, light blue, and a bit of dark blue were used in a tile mosaic around the food service area. These uses tied in the bright Blinn College blue but also introduced variations. Neutral colored, darker tile flooring could bear a lot of foot traffic and keep the focus on the walls, where the blue was featured. To keep the flooring interesting and more modern, larger 12×24 tiles were used instead of a more square and institutional look. Knowing how other projects have worked can make it easier to decide on your own building’s finishes. But it can be overwhelming without some guidance from the experts — the architects who have a lot of experience with different materials. First, Read-Warden or her Arkitex Studio colleagues will present some boards with different color options to get a feel for what direction you want to go. Once a color palette has been nailed down, architects show larger samples of materials. Big pieces of carpet can help you see the patterns better than small swatches, and three-dimensional sketches with fully colored walls can help you see how color will appear in a way that a 2-by-2-inch paint chip simply can’t. Read-Warden says that some clients like to have the architect provide much of the vision and leadership on the interior finish choices, but some have very clear preferences. It’s the architect’s job to incorporate those preferences into a solution that will work for the building’s users, she says. By working with the expert architects at The Arkitex Studio, your building will follow both form and function, looking great and holding up to all the uses it will get over time. Schedule an appointment if you’d like to learn more about how we can help you with all the aspects of your next project.